Well, it’s been a busy seven days in the chocolate world and Chocolate Week has culminated in the prestigious Chocolate Show in London this weekend. For me, the grand culmination is a Cocoa Runners box of bean to bar chocolates from around the world. I’m very excited. The team at Cocoa Runners have a particularly difficult job it seems. They spend their time travelling around the world in search of less well known artisan bean to bar (or even tree to bar) chocolate makers. They get to try a myriad of different chocolate products and then select the best for our delectation. They are specifically interested in small batch craft bars, single origin bars and rare chocolate that is ethically produced. Real chocolate is their passion and they are not interested in mass produced offering or ones that contain palm oil and other unnecessary additives. Many of the bars are hand wrapped as well as hand crafted. Based in the UK, though I couldn’t work out if it was in London or Newton Abbot, Cocoa Runners offer three different ways of buying chocolate to those of us based in the UK and Europe. a “chocolate library” from which you can choose any of the three hundred craft bars stocked. The box I received was a discovery tasting one and when I broke into it, a whole new world of chocolate opened out before me. I found a pleasing selection of bars from different producers, most of which were beautifully packaged in foil and cardboard and all with varying tastes and textures; I’d not come across any of them before. A set of cards indicating the type of chocolate and background accompanied the box as did some guidelines on how to taste this food of the gods. Some of the cards were missing from my pack, which meant I didn’t get the detail on everything I had. I used to think that the darker the chocolate, the more bitter it would be. Since starting this blog and having the opportunity to try a number of different chocolates from around the world, I have subsequently realised my error. Some of the dark chocolate in this box is less bitter and far more palatable than many types of chocolate I have tried with a lower cocoa content. I am seriously impressed by the box I received from Cocoa Runners (missing cards aside), I like the concept, the ethos, the packaging, the chance to taste lots of different artisan chocolate bars and the stories behind the companies. 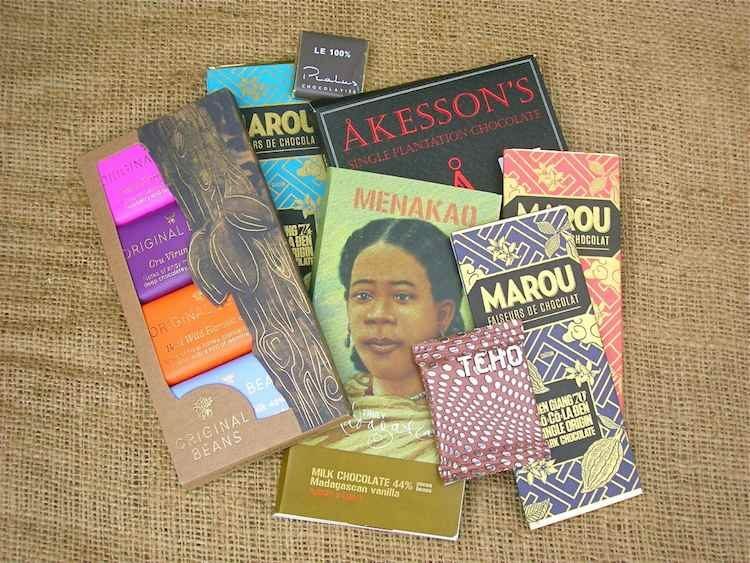 Menakao Milk Chocolate (44%) – launched in 2006 by a fourth generation member of the Cassam Chenai trader family who settled in the North-East of Madagascar, Shahin took the name Menakao from the word mena meaning red, which is the colour of the soil that Madagascar is famous for. With the cocoa beans being bought and processed locally, the Madagascan economy benefits from four times the income produced from fair trade chocolate. As a lover of dark milk chocolate, I was really looking forward to this one. The scent of tobacco reached my nostrils first. The chocolate, which was slightly grainy in texture released different layers of flavour as it melted. Notes of tobacco with fruity tones mixed with chocolate tasting of caramel was an interesting combination. Madagascar is well known for its fruity chocolate, so this I was expecting, but I hadn’t bargained for its earthy nature which left an unfamiliar taste in the mouth. Is this the taste of Madagascar’s soil? As with all good chocolate, this is not a bar to be wolfed down but to be eaten over a period of time and savoured. The combination of flavours grew on me as I went along. Akesson’s Madagascar (75% Criollo) – another bar made from beans grown on Madagascar, but this time, produced in Switzerland. The beans are grown organically on the Ambolikapiky Plantation in the North-West of the country. I could smell the fruity notes of this one immediately. I also tasted them as soon as the chocolate hit my mouth with citrus being to the fore. This is a very smooth bar, that melts beautifully on the tongue and really has very little bitterness to speak of. I can see why it won silver in the Academy of Chocolate awards in 2013. The only thing that let this bar down for me was the plastic packaging – the only bit of plastic to appear in the whole box. Marou Bars from Vietnam – Soya, gluten and dairy free, these dark chocolate bars contain only cocoa solids and cane sugar. Why then, I wonder, do other chocolate bars all contain emulsifiers, usually soya lecithin? These were all wonderfully smooth and had a good snap and shine to them – a conundrum indeed. The Tien Giang 70% has a spicy and fruity scent but tastes very strongly of honey. I couldn’t quite believe that there wasn’t honey in the actual ingredients. It’s very smooth, not at all bitter and leaves the flavour of honey behind in the mouth long after the chocolate disappears. I couldn’t get enough of this one and despite milk chocolate being my first love, this was my absolute favourite bar. I’m saving the Lâm Dōng 74% and Bària 76% for another occasion as I want to appreciate the flavours they have to offer and not be overwhelmed by too much chocolate. If the first is anything to go by, I am in for a real treat. Also included in the box was a little 8g square of organic single origin milk chocolate 53%, which I really loved. It was smooth and rich with fudgy notes. The square disappeared far too fast and I was sorry not to have received a much larger bar. There was no tasting card for this one, but it did state on the wrapper that it was produced in San Francisco by TCHO. Found drifting at the bottom of the box was a tiny square of Le 100% from French chocolatier, Pralus. I have tried 100% chocolate made with no added sugar before and whilst I find it interesting and not at all unpalatable, I think it best used for cooking or making hot chocolate. The chocolate was dark in colour but smelt rich and fruity. It tasted a little bitter but the fruity citrus notes sang out. However, it was strong coffee that lingered on the palate. Original Beans – this pack contained four 12g bars all made in Switzerland, but from beans sourced from different parts of the world. The chocolate is certified organic and as in the Marou bars, the ingredients are minimal and contain no emulsifiers. Likewise, the bars are smooth, shiny and have a good snap. I tried one of the three dark bars, the Beni Wild Harvest 66% from the Bolivian Amazon. This fairly fizzes on the tongue. The scent of tobacco belied the fruity notes with floral and minty tones. The combination made for an intriguing experience. The Piura Porcelana 75% from the Peruvian Andes, the Cru Virunga 70% from Eastern Congo and Esmeraldas Milk 43% from the Ecuadorian rainforest, I’m keeping for later. Thanks to Cocoa Runners for sending me one of their chocolate boxes to try. I was not required to write a positive review and as always, all opinions are my own. Wow, what a wonderful collection of international chocolate. I think it’s amazing how you can fine tune your palate to chocolate. Even my girls have acquired a chocolate palate and will not eat certain high street brands now as they don’t taste of chocolate! Yes, it’s really interesting how you can learn to taste different things in chocolate. Sugar is a great masker of flavours I find – too much of it anyway! I certainly ate plenty of it when I lived in Switzerland CC. I didnt even realise you could get a monthly subscription box for chocolate!. This is wonderful!. I may have to treat myself!. Wonderful post and great read. A monthly box of chocolate arriving through your door is, I’m sure, what most of us need Jen. Yes Catherine and luckily there is a growing trend for real, ethical and interesting chocolate. What a great way to spend a great week! A Cocoa Runners box to finish off Chocolate Week! ooh what a treat! Great week of chocolate posts, I’ve been enjoying reading them. Wow! There is lots of info here. It is all very interesting. There is lots people don’t know about chocolate. I often just buy bars of dark chocolate but I never check their origins. It has been a very exciting week for you. I loved reading this post. The packaging is beautiful – I am having a vision of you though rolling away like Violet Beauregard in Charlie & The Chocolate Factory after so much chocolate! Haha, it did feel a bit like that Sarah. Thought I’d have a break after chocolate week, it must have lasted a whole day! Difficult job ha ha! Do you think Cocoa Runners have any jobs going? I could quite happily swan round the world finding chocolate for our delectation! Sounds like a fun sort of job doesn’t it Kate? I’d be happy to join you. Love the idea behind cocoa runners. You are being spoilt with such fab chocolate. I did feel spoilt Bintu, but I really appreciated the fabulous chocolate.